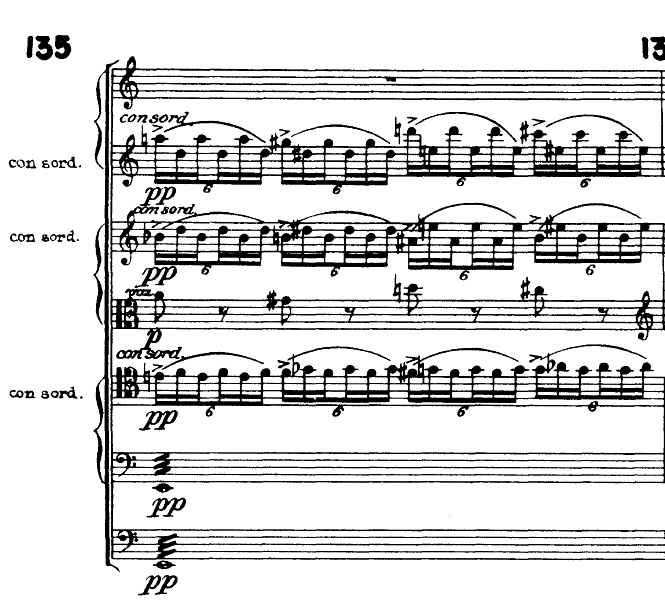 I haven't seen this on any other score, which at least maintains a consistent treble clef design. Is there a specific reason why they wouldn't just use the same treble clef punch on all the staves? Re: Interesting clef inconsistency - any explanations? For my eye it doesn't look punched, but really engraved. If you look at other symbols they all look differently from each other. It's definitely NOT punched. Look at any other symbol and you'll see similar inconsistency (accidentals, grand staff braces, etc.). On the other hand, what a fine hand drawn specimen! That's really hard to do with consistency and whoever did this did a great job. Printers of moveably type would often use different typefaces if they ran out of letters within a form, but that excuse isn't there if it's stamped from a tool. Maybe they started each line on a different day, or after lunch, and forgot which tool they'd used last time? This is definitely autographed (i.e. hand-written). The slurs were made with french curves. Beautiful handwriting indeed! I wonder if this could have been done by Langensheidt (sp?) who autographed many of Berg's scores (for instance, the Chamber Concerto)? Yes, I noticed several 2nd Viennese school scores to be engraved so. Some of Boulez pieces for Universal Edition were done by that technique as well. That is very nice, although somewhat idiosyncratic hand copying; it is definitely not autography. The beams are not ruled, the stems are not straight, the accent marks and tremolo marks are all over the place. The symbols all vary with each repetition. Autography was done on a drawing board; every line was ruled to perfection, like an engineering drawing, and anything hand drawn was done with much greater accuracy than in the example. I wish I had an example to post. It had almost the precision of very fine engraving. I agree about the accents and tremolos, though. This may not be autography up to John's high standards, but what John says doesn't prove this is not autography. Ere, from what I understood from my Arnstein days, "autography" is hand copying in which all the line work is done on a drafting table with special equipment. "Hand copying" comes in many forms, some of which mimic autography, but its essential characteristic is that the line work is eye-balled, using at most a ruler and flexible curve, not drafting equipment. Since the stems don't all parallel each other and aren't the same thickness, and the beams vary in thickness and distance from each other etc. and the angles and distances are greater than can be accounted for by scanning, this example would appear to be hand copying, not "autography." Arnstein often employed an autographer, Mitzi Polnauer, who was capable of beautiful hand copying, much better than the example, as well as autography, which looked like engraving, but warmer, because of the personal touch. Or if one doesn't accept these definitions, then the example could be called nice hand copying or bad autography. Excellent examples of autography are various works of Berg, such as the Double Concerto suggested by RMK and the Vioiin Concerto. As technology advanced, rub-on (Notaset) characters were used extensively for the remaining hand items like clefs, accidentals, note heads, slurs etc. so that the final result was comparable to engraving.